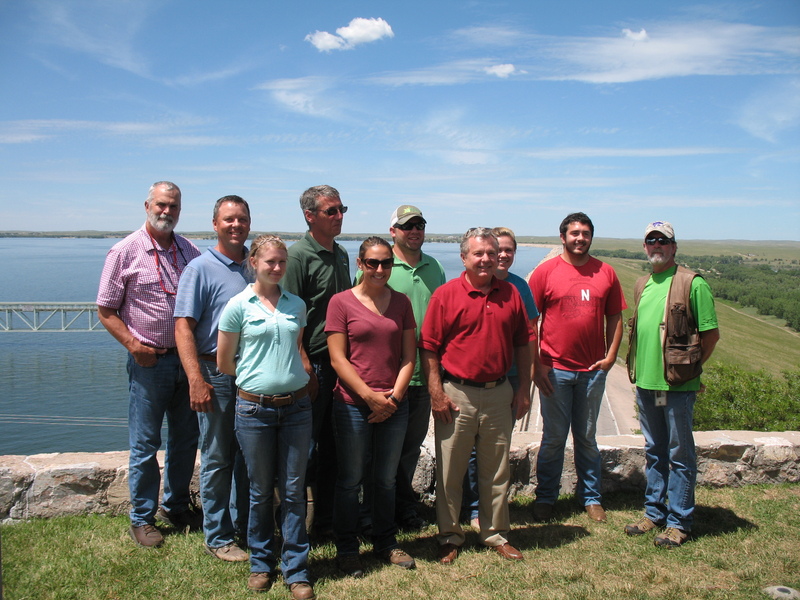 Employees of the U.S. Department of Agriculture’s Natural Resources Conservation Service (NRCS) toured Central’s hydro-irrigation project on July 14. Tour participants included Nebraska NRCS State Conservationist Craig Derickson of Lincoln and representatives from NRCS offices in Grand Island, Spencer, York, Lexington, Elwood and Minden. 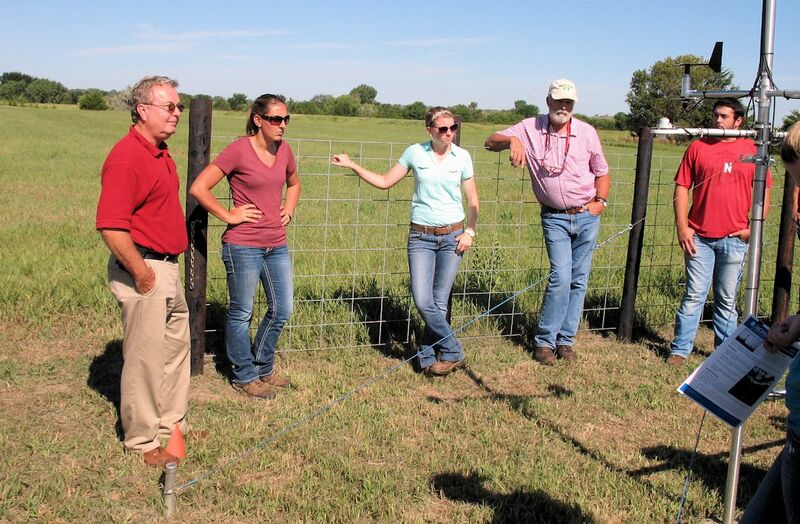 Participants in the NRCS tour, including State Conservationist Craig Derickson (at left) listen to an explanation of how data from an automated weather station is used in the E67 irrigation management/telemetry project. The participants assembled at Central’s office in Holdrege, then headed to several sites within the District’s irrigated area, including stops showing pivot and sub-surface drip irrigation installations on Central’s system, and automated check gate structures along the main canals. One of the highlights in the morning was a stop at a site within the E-67 Canal area where Central’s Conservation Director Marcia Trompke explained the workings of the new telemetry project. The telemetry project began this spring with the installation of radios, remote terminal units (mini-computers that relay data), and weather stations to serve one-third of the turnouts on the E-67 system. Over the next two years, the remaining turnouts will be similarly equipped. This project’s objective is to gather irrigation water use and environmental data to support Central’s irrigation water management, water conservation and water quality goals. The project involves the cooperation of Central’s customers irrigating about 5,800 acres in the E67 area north of Elwood and Smithfield. The project will collect irrigation water use data from irrigation flow meters and weather monitoring sensors crucial to irrigation management. Data will be available in real time to Central and individual irrigators through digital applications to help customers make sound irrigation management decisions. The project is partially funded by a grant from the Nebraska Environmental Trust Fund and includes partnerships with UNL Extension for educational services and the McCrometer Co., which is providing flow meters, technical expertise and equipment installation training. The tour continued on to the Gothenburg Control Center where Electrical Superintendent Devin Brundage explained Central’s highly automated system for monitoring and controlling water all the way through its hydro-irrigation project. After lunch at Gothenburg’s Nebraska Barn & Grill restaurant, courtesy of Central, the group then headed to the Lake McConaughy Water Interpretive Center where the participants viewed a video about the construction of Kingsley Dam and then toured the reservoir’s control structures. Kingsley Dam Foreman Nate Nielsen then explained the workings of the Kingsley Hydroplant, which was generating 30 megawatts of clean, renewable hydroelectric power at the time. Central routinely offers tours of its hydro-irrigation project to organizations and groups throughout Nebraska, as well as groups from other states and foreign countries. If your group is interested in a one- or two-day tour of the sprawling project, contact Public Relations Coordinator Jeff Buettner at (308) 995-8601. We’ll set a date for you!